Land titles, distribution, grants, etc. 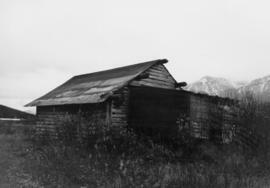 Head on photograph of a trapper standing in front of his cabin in Prince Rupert, BC. 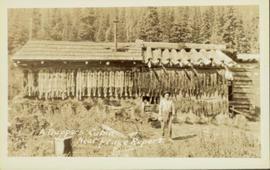 The front of the cabin is covered in various pelts. 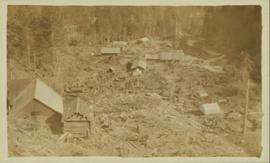 Printed annotation on recto reads: "A Trappers Cabin near Prince Rupert." 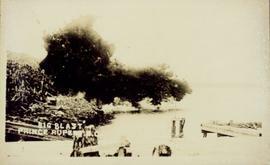 Foreground shows a rocky shore covered in debris. 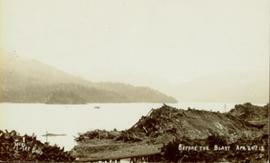 A small crowd is visible along the coastline, and there are foggy outlines of hills beyond the water. 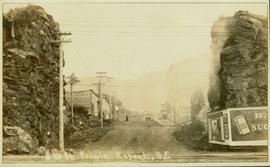 Annotation on recto reads: "McRae Bros After the Blast 24th Apr. 13." 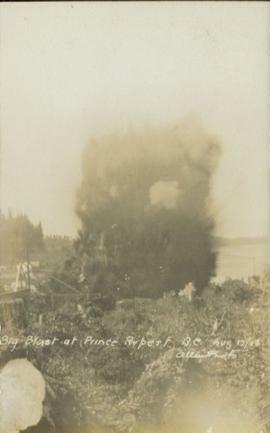 Photograph shows a large explosion surrounded by clearcut brush. Some machinery is visible in the foreground. 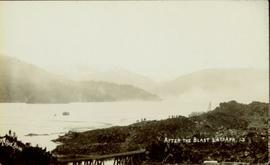 Annotation on recto reads: "Big Blast at Prince Rupert BC Aug 17/08 Allen Photo." 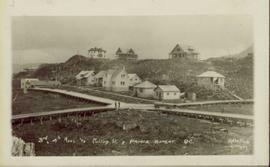 File consists of an oral history given by Bill Regan and Georgina Collins, which was gathered as part of Dr. Mike Evan's oral history project with the Prince George Metis Elders Society. Includes consent forms and transcripts. 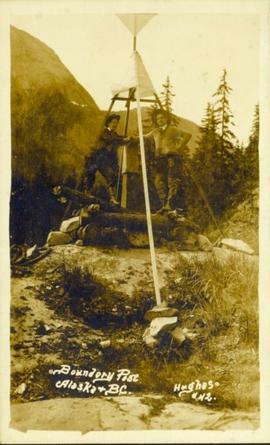 Photograph of two men posing next to a four-legged post erected in the wilderness. 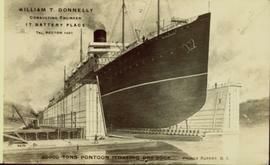 Printed annotation on recto reads: "Boundery[sic] Post Alaska & BC. Hughes #42." 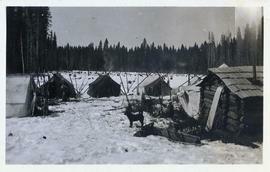 Photograph is a printed postcard depicting scattered small buildings and a tent. Trees have been removed from the area around the buildings and many stumps remain. 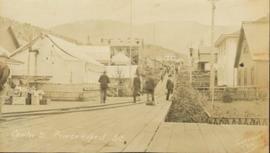 Street view of Centre Street in Prince Rupert, BC. Buildings are in various states of construction. 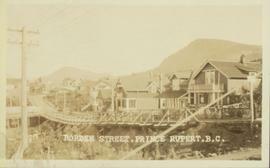 Printed annotation on recto reads: "Centre St Prince Rupert B.C. June 20/08 JDA."" 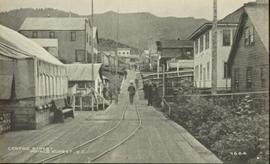 Street view of 5th St. in Prince Rupert BC. 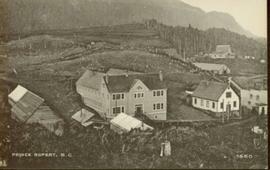 The dirt road is flanked by two partially demolished rock faces. 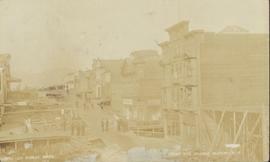 Printed annotation on recto reads: "5th St Prince Rupert, B.C."